Very Good. Sunrise by Kingsbury, Karen, 2007-05-08. Trade paperback (US). Glued binding. 336 p. Baxter Family Drama--Sunrise, 1. I have enjoyed the complete Redemption,Firstborn and Sunrise series - all about the Baxter family. 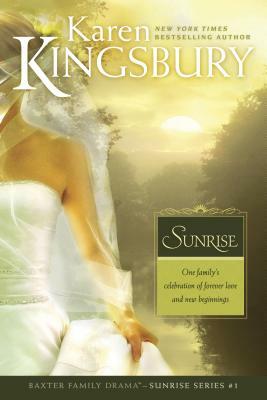 Sunrise is another favorite read - about Katie and Dwayne's marriage, and much more about the Baxter family lives. Another must read book. All of her books are 5 stars in my opinion. This book is grated as one of my favorite books it is just awesome and I would recommend it to anyone. I was never disappointed with any book I bought at Alibris Books. This book is a must read for anyone who loves a happy ending. It is of course useful to read the books in the series that precede this one. As a huge Karen Kingsbury fan I have to say that she has outdone herself this time. The entire book is like a fairytale, complete with enough description to feel like you are a part of the celebration. A book to encourage any girl waiting on God's time for her prince charming.